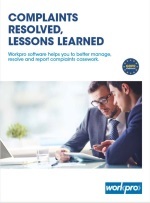 Workpro complaints management software will help you to deliver excellent complaint handling, ensuring all complaints are dealt with consistently, fairly and quickly. It is a complete system for logging, processing and reporting complaints and customer feedback. Find out more by downloading our brochure.